More than 800 people voted in the 29th and 37th Wards the first two days of early voting, which started Monday, March 23. In the 29th Ward – where Ald. Deborah Graham and police Sgt. 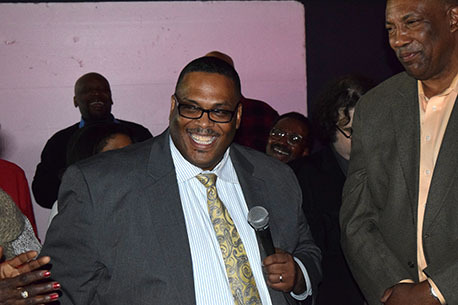 Chris Taliaferro are running – 426 people voted, according to a ward-by-ward comparison conducted by Aldertrack. In the 37th Ward – where Ald. Emma Mitts and CPS teacher Tara Stamps are running – 389 people voted. Citywide, 21,012 Chicagoans cast their ballots Monday and Tuesday, Aldertrack reported. Early voting continues through April 4 at 51 locations throughout the city – one in each ward, plus the downtown Chicago Board of Election Commissioners office. Chicagoans may vote at any of the sites. All sites are open from 9 a.m. to 5 p.m. Monday through Saturday, and from 9 a.m. to 3 p.m. Sunday (March 29). 24th Ward: Douglass Library, 3353 W. 13th St.
28th Ward: West Side Learning Center, 4624 W. Madison St.
For a complete list of locations and more information about early voting, click here. 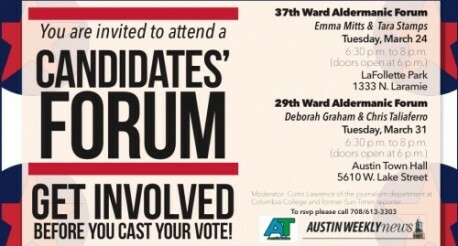 It’s not too late to email austintalks.org@gmail.com the questions you want the 29th Ward candidates to answer during their March 31 debate, sponsored by AustinTalks and the Austin Weekly News. Hope to see you next Tuesday night at Austin Town Hall.